Why does adversity make some leaders and break others? Dr James Kelley stumbled across the answer – he thought he was going to write a book on corporate wellness, but what emerged from his conversations with over 100 CEOs was a pattern of how effective leaders choosing to redefine a critical moment of adversity as the source of growth and strength. James’s strength is the spoken, not the written, word, so he developed a brilliant methodology to write a chapter a week using a smart mix of writing and speaking, which he sets out in detail in our conversation. 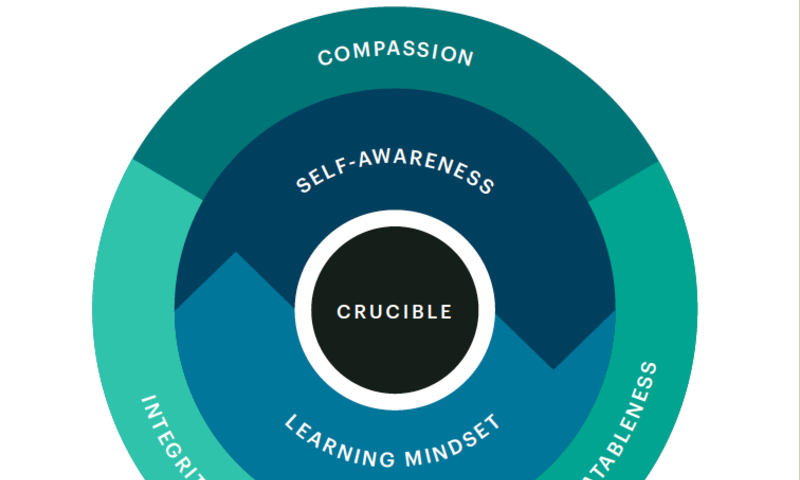 This is the model he describes, showing how leaders can use moments of adversity – the ‘crucible’ -to grow their self-awareness, compassion, integrity, and the value of relationships around them when they have a growth mindset. Alison Jones: Hello and welcome to The Extraordinary Business Book Club. And it’s a delight to be here today with Dr James Kelley, who was born in Portland, Oregon, but at the age of 18 moved to the Midwest to attend undergraduate studies. From there his life took many twists and turns, resulting in a PhD in international marketing from the University of Western Australia in Perth. You didn’t see that one coming. After spending seven years in Philadelphia teaching, he uprooted his family, and he recently began working at United Arab Emirates University. He was, until fairly recently, the host of the Executives After Hours podcast. 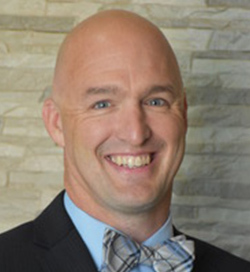 He consults and speaks on the topic of diversity and leadership, and he is the author of The Crucible’s Gift: 5 Lessons from Authentic Leaders Who Thrive in Adversity, which was published in April 2018. Welcome to the show, James. James Kelley: Alison, thank you so much. And can I just start off by saying, I love your voice. It’s just mesmerising. Alison Jones: I hope you’ll be able to answer questions all right. Alison Jones: Stay with me. Stay with me. Alison Jones: I think it’s so easy to impress an American with a British accent – it’s embarrassingly easy. James Kelley: Well, I think the irony is that I’m around British people all the time. My whole world is British. Alison Jones: All the ex-pats. James Kelley: Yes. We just bastardise your language. You guys have proper English. It’s nice to be around. James Kelley: No. Not everyone has. But I appreciate the optimism. Maybe after this, they will. Alison Jones: Just tell us. Just give us a brief outline of the book. James Kelley: Essentially, the best way to describe the book is through a diagram that I can describe, hopefully fairly clearly. But the idea is, if you think of a bulls-eye, with three circles, you have the centre, one outside that, and then a third one. And if you start with the actual centre one, and write the word “crucible,” for me, in the book, what I found, is that this is where leaders actually, was the pivot point, was the catalyst for them, if you will. And then when you move out from that to the next circle, it’s divided into two, with one half saying “self awareness” and I’ll get to the second half in a second. But the pattern became, crucible, grow in self awareness. And I thought, okay, that’s interesting. And after about 40 or 50 interviews, I started to see this pattern. And then, if we go out one more circle, and we’ll divide that by three, and put “compassion, integrity, and relatableness” in there. What I’ve found is that every time a leader had some adversity and they were able to develop and grow their self-awareness, they were developing their compassion, their integrity, and their value of relationships around them. But it only happened – when you go back to that self-awareness circle, in the bottom half – it only happened when they had a growth mindset. This book walks you through the process of why adversity is the catalyst to develop your self awareness, to be more compassionate, to act with more integrity, to value relationships important to you, but most importantly, to embrace a growth mindset to accomplish all those other things. Alison Jones: Yes. Brilliant. And, actually, when you look at the book, having that simple model really draws it all together. It means you can see it all at a glance and you get the dependencies between the elements. If you can draw out your ideas, it makes it so much more easy to communicate them, and also, to think about how they do relate to each other. Did you find that? James Kelley: I think, that’s for me, is what’s powerful. Alison Jones: Yes. And it’s … With your permission, I’ll put the little diagram up on the show notes, so people can see it. Alison Jones: Because the lovely thing is, it’s not particularly fancy. It’s just really simple. But it’s incredibly powerful. And, as you say, it gets the message across in the way that five pages of text just don’t, as you see it all at one go. Alison Jones: Yes. Going back to that question about adversity, because I think this is interesting. Yes, for leadership, but generally for life, actually, why do you think it is? The centre of your model, you’ve got that crucible, that moment of crisis, if you like. Adversity can have the impact you describe. That at its best, that’s what we rise to. But also, it can really break some people. Alison Jones: It makes some people. It breaks others. What do you think makes the difference? What made the difference to you, personally? James Kelley: Right? And that’s defining them, right? “I had this. This happened.” The word “to me” grates me a little bit. Things do happen to us, but you choose how to react to them. I’ve found that the leaders who are able to define the adversity for themselves in a way where they could grow were the ones who were best suited for this authentic leadership model that I discuss. Alison Jones: And how did that play out for you, personally? James Kelley: I mean, personally my life is … I think it was funny. I was on an interview the other day, and I said, “My life is no better or worse than anyone else’s. It’s just my journey.” My bucket is full of my pebbles of adversity. Your bucket’s full of yours, Alison. Some buckets are bigger than others, and some are smaller than others. The difference, for me, for my adversity, is that from a fairly young age, I realised that the environment I was raised in, though supportive overall, was neglecting of emotional support. And I had to make some decisions of how am I going to react in these situations? How am I going to grow? I’ve always been a little bit of an old soul. I’ve always been. In high school, I was the kid who wanted to have the emotional conversation, which was off-putting for most other teenage boys, to be fair. I think that’s always been inside me. The bigger question, honestly, is, for most people is, if that’s not inside you, how can you grow as an individual to embrace it? I think part of it is experience. Part of it is age. And part of it, it really is about being vulnerable to the possibilities. Alison Jones: I like that phrase, “vulnerable to the possibilities,” rather than, “open to the possibilities,” which is what the common phrase is. Because it is wound-making. But it is also transformative. What was also interesting to me was that you admit in the book that you didn’t really plan to write that book. You started … Now, this is a bit of an accident, this book. You originally planned to write a book called The Wellness CEO. That’s why you set up the podcast. And you started interviewing all these CEOs on your podcast to research that book. Just tell us what happened. What changed? James Kelley: I think my perspective. My antenna went up, if you will, to really … I started to get more interested in the stories about the leaders than I did about corporate wellness. If you’re going to write a book, as you know, writing a book can be a painful process. If you’re going to write a book, you might as well pick the book that most interests you, the topic that most interests you. And I thought, for my first book, I didn’t want to rap myself over the knuckles with a ruler to get done with it. I wanted to find something that I was passionate about and that really drove me. As the topic went on, and I was interviewing, about episode 50 or so, I just started to see the pattern. I started thinking, “Man, that’s way more interesting than a wellness CEO. Let’s see what happens with this.” Probably about episode 140. Initially, it was about 90 episodes. I started to write. But then I kept interviewing, just adding content as I went. And, yes. That, essentially, is just … It was the opportunity that seemed the best fit for me as an individual in terms of where I’m at in my journey. Alison Jones: I love that, because I very often talk to people about writing their book, and try and prise them out of their garret. Some people just want to sit themselves in a room, lock the door and write their book. And they think that’s a good thing, because it’s focused, and it will get the work done, and so on. But actually, when you are out there, when you’re doing the research, when you’re doing like both of us, I think, did. Use the podcast to interview people to get their stories, you can have these shifts of direction. They say you can’t steer something until it’s actually moving. And sometimes the book does take on a life of its own and goes in a more interesting direction and becomes a book that actually takes you where you maybe hadn’t quite expected, but becomes a better book in the process. I thought that was a really interesting story. James Kelley: It was an interesting process. Me writing a book, if you were to pull anybody that knows me from when I was the age 22 and prior, I don’t think book would be on the top 100 list, in terms of what I would accomplish. For me, it was something that … And this is probably the worst metaphor possible, talking to a woman, but … Which probably should make me to give pause. But it was something I just birthed. It was something that … I read the book now, and I’m like, “I don’t remember writing that.” You know what I mean? It just came out of me. James Kelley: Yes. Well, no, no. I literally said that to my wife. I was like, “Did I really write this part?” She’s like, “Yes, yes.” I was like, “Huh. That’s actually fairly interesting. Okay. Good for me.” And part of it, and we can get to this in a second if you want, but part of it is the way I wrote the book, which also suited me for someone who is a bit insecure about their writing style. Alison Jones: Well, do you know what? Let’s go there, since we’ve opened that conversation up. Tell us, what does writing look like for you? How did you … For somebody who wasn’t a natural book writer, how did you get started? And how did you keep going? James Kelley: I was doing lots of research, and it helped that we were taking a family vacation in Portugal for six weeks. And this is where the book was written, right? But I had a formula for what I wanted to do. This would be how the week would go. On Monday, I would write the outline for the chapter. And on Monday afternoon, I would research the content of that chapter: key findings from the literature, academic literature, and then I would then look through my transcripts, remember all my interviews. And I would grab evidence from the interviews backed up by the literature that I found. And I’d put it all into a Word doc. And then what I would do, is by Tuesday afternoon, when that’s all done, on Wednesday morning, my wife would interview me based on the questions that I wrote for the outline. The outline was written in a question form. Then she would interview me, and we’d record it. And the interview would be 25, 30 minutes long. I would send it off to be transcribed. And I would use the content that I had found on Monday and Tuesday, combined with the recording that was transcribed. And by Friday I would have a chapter done every single week. James Kelley: Over seven weeks, I wrote eight chapters of the book. Alison Jones: That’s absolutely brilliant. Did you stumble across that technique, or was that the result of lots of false starts? James Kelley: I would love to tell you that I’m this ingenious person. But there are a couple of firms in the US that help authors write. And one way they do it is that they interview the author and record. And I thought, well, for me, that’s probably best way to do it. Because I have a hard time starting my ideas. That, for me, is the most painful process. A great example is, I had to write … I wrote a blog post about three weeks ago. It took me four hours to write four paragraphs. James Kelley: Now … Exactly. Now, if I would have just spoken it out, if I had Dragon … I forget what it’s called, Dragon something or other, to transcribe. James Kelley: What’s it called? Do you remember what it’s called? Alison Jones: Dragon Dictate, isn’t it? Something like that. James Kelley: Yes, yes. Dragon Dictate. Thank you. If I had that, I would have been done probably in 30 minutes. For me, the verbal is my strength. It’s turning that verbal quickly into the written, that was what I came to pretty quick as I tried to write the book two or three times starting early on, and I just thought, this is not going to work for me. I’m going to get frustrated. My confidence is going to go down. But once it’s on paper, for me, it was just so easy to wordsmith it and take things out. I would always encourage anyone who’s afraid of writing, do it this way the first time. Because I feel like it gives you the confidence to know that you have it in your brain. James Kelley: You just need to find an easier way to get it out. Alison Jones: And also, that idea of getting somebody else in the room with you is really helpful. Because you can feel a bit of an idiot talking to your screen if you’re just using Dragon Dictate. And you run out of steam. But when it’s an actual conversation, that’s when your ideas come, particularly if you’re an extrovert. James Kelley: Yes. Well, and the best time to do it, is the people who don’t know your topic. And you tell them as their instructions, “Ask as many ‘why’ questions and clarification questions as possible if you don’t understand.” Because having my wife do that allowed me to simplify concepts that I thought were simple. James Kelley: As you know, as a writer, one of the best things you can do, especially when you’re writing a business book, I believe, at least, is the more simplistic you can write it, the more conversational you can write it, the more digestible it’s going to be for your audience. Alison Jones: Which is counterintuitive to a lot of people, who feel that if they’re going to be taken seriously, they need to use the long words and the highfalutin language, and make it really dense and chewy and ram every bit of research in there. And what happens is, people just give up and lose the will to live. James Kelley: Yes. There’s been books in my space that I’ve read that just gave way too much research. And I’m an academic by training. Innately, academics always want to just pack in their knowledge. For me, when I read a book like that, I fall asleep. I wanted to write a book that I knew I would want to read, as a consumer. Alison Jones: And, of course, end notes are a wonderful thing. I always tell people, if you have to have that in, unpack it and let’s put it in the back of the book. I mean, there are some books, I’m thinking of Jim Collins’s Good to Great, it’s almost half end notes, isn’t it? And if you want that stuff, it’s there. But it doesn’t clog up the text itself. That’s a good thing as well. Yes. Fantastic. That’s really interesting. And now that the book is published, has it changed life for you? What’s become possible? What ends? What’s begun in this new stage, now that it’s finished and actually out in the world? James Kelley: Yes. At this point, my kids bring my coffee out on a platinum plate every morning. Alison Jones: That’s pleasing, isn’t it? James Kelley: You know what? Nothing has changed. And I don’t mean that in a sarcastic tone. It’s that, for me, my publisher reminds me often that it’s a marathon, not a sprint. The book’s only been out about five months. Five months, I think, give or take? Four months, five months? Alison Jones: We are speaking in September in 2018. James Kelley: The book came out April 2018. Alison Jones: Five months, yes. James Kelley: April, May, June, July, August. Yes. Five months. That’s relatively early from a book perspective, and especially an unknown author perspective. I try to keep that in mind. I will tell you that I am seemingly getting more opportunities to be taken seriously in the leadership space that I didn’t know were going to come. But I mostly look forward to what’s going to happen as I keep trucking along, and as I feel more competent and confident about speaking about it. When you’re an academic, we’re supposed to be the experts in our space. I did the unthinkable and went from marketing and shifted to leadership. That’s not a normal transition for more people. It’s more natural for me as a human being than marketing, ironically. It will take time. I do hope … And if it doesn’t, so what? At the end of the day, I have to be okay with the fact that I believe the people who endorsed my book, they’re world-renowned experts, right? They’re world-renowned leaders. They believe in what I wrote. For me, I feel like that is enough credence that the work that I produce is unique. Alison Jones: And I’m guessing … Certainly this was the experience for me. Just being the other side of having done that thing changes you slightly as well. It changes how you see yourself, as well as how other people see you, doesn’t it? James Kelley: I think so. I think people overestimate my intelligence now. Alison Jones: Excellent. Well, that’s always useful, isn’t it? James Kelley: Oh, I mean, obviously, I’m a little bit self-deprecating. You know, I’m oblivious to these things, Allison. I wish I was more in tune with this stuff. For me, I’ve never thought about how people react to me. I mean, many people are like, “Oh, you wrote a book.” But I’m like, “Yes.” But it’s like getting the PhD. It’s a labour of love. There’s parts you hate. But it’s the journey that you appreciate when you’re finished. Alison Jones: Yes. The having written a book is so much more fun than the writing a book, isn’t it? James Kelley: Yes, yes. In fact … Although, I am … Ironically, the only part that I really disliked about the process was the revisions. James Kelley: I think the first draft for me was really fun. By the thirtieth revision, I was like, “Oh, sweet Jesus, Batman.” How much difference is it going to make? But that’s … Those tweaks are what do make the difference at the end. James Kelley: But it was difficult. Alison Jones: For somebody listening to this who hasn’t even got to the first revision stage yet, they’re still at that blank sheet of paper, or they’re 10,000 words in, what tip would you give them? I think you’ve already given them … I’m being a bit greedy here. Because that tip about the conversation stuff is absolutely fantastic. But is there anything else you’d say to them? James Kelley: I think the thing that I was most proud of is that I wasn’t so stubborn to my ideas … I know this sounds probably a little bit counterintuitive. I wasn’t so stubborn with my ideas that I thought they were the best thing since sliced bread. I was open to the feedback that I received from my editor. And often, some authors, especially first time authors, either give away everything to appease somebody, or they’re so stubborn that they miss the point they’re trying to make. They could make their point better with the feedback they’re receiving. I would always encourage someone to find the balance of what’s necessary to say, and what you can say differently that says the same thing but better. And it’s a personal balance that you have to figure out, as an individual. But my almost lack of confidence about certain aspects helped me be flexible in the editing process. And I trusted the people I had around me. That added a ton of value when they gave feedback. Alison Jones: In fact, the fundamental tip there is get some good people around you. Get a good editor. Because you’re right. The value they can give. But you have to trust an editor’s judgement . You also have to trust your own judgement . It is a balance. And a good editor will back off if there’s something that actually is really, really core to you. Alison Jones: But they can bring so much to it. And if you have the humility to consider it, and accept it, they can improve your manuscript hugely. James Kelley: Yes. No. I totally agree with you. I think … My editor was great. He was an ex-editor of Wiley Business Books, executive editor. He understood the balance of the egotistical business leader and the need to write a digestible book. And we had early conversations. He would recommend a ton of stuff. And I would say yep or no, or … And there’s definitely parts of my book where you see his language versus mine a little bit. But for the most part, he was tremendous at being supportive and finding space for me to have my own voice, especially as a first time author, where I was unsure of where my voice would be. Alison Jones: Yes. They do say, your first book is almost the one where you learn to write a book. You’re going to have to write another couple, now. Alison Jones: See you back here next year, then, yes? Alison Jones: Apart from The Crucible’s Gift, obviously, what business book do you recommend that everyone listening to the podcast should go and read? Alison Jones: It’s still a good one. James Kelley: Everyone goes to that one. They even have an updated version for today’s world. But the principles are so foundational. And it just makes such common … I mean, there’s a reason why that is a legendary book that people read again and again. If you want something outside the space of leadership, there’s a book called Play Bigger. And it’s by a series of guys. But it’s all about niching your product or brand, basically being the niche brand. But it’s fantastic. It’s a fun read, it’s an easy read. Sorry. It’s about being a category king. One of the authors wrote a book called Niche Down recently, so I just mixed those. But it’s about being a category king in your product category. And it’s written really well by … One of the authors is a New York Times bestseller, Kevin Maney. It’s a really well-written book that’s entertaining and insightful with lots of lessons. Another book that I really like … Sorry, I’m giving you more than one here. But the second one is about communication and about a topic that organisations are moving towards fast and it’s called ‘appreciative enquiry’. And it’s by Jackie Stavros and… I can’t remember her colleague’s name. But it’s called Conversations Worth Having. Really easy book, I read it in five days. Really impactful, tons of tactical and practical things you can use instantly with your family, with your coworkers. I couldn’t recommend that book any more either. Alison Jones: Awesome. Thank you. Well, three recommendations there. Like my “to read” pile wasn’t big enough already, but thank you. I don’t know any … Well, I know Dale Carnegie, obviously, but the other two are new to me. Just to clarify, the title of the second one, was it Category Kings? James Kelley: Sorry. I totally went ADD on you. The first book is called Play Bigger. It’s by Chris Lochhead, Kevin Maney, and I can’t remember the other two authors. And it’s about becoming the category king in your product category. James Kelley: The second one is by Jackie Stavros. And I’m awful with names. I can’t remember the coauthor of that book, but it’s called Conversations Worth Having. Alison Jones: Conversations Worth Having. Yes. Brilliant. Good. All right. Well, thank you very much for those. That’s brilliant. This was a question that I introduced very recently into the podcast. And I’m so glad I did. I’ve had so many great recommendations from it. It’s brilliant. James Kelley: Have you ever wondered how many people just make ’em up? Alison Jones: Well, it is quite funny. When you’re interviewed, sometimes people will say, “What are you reading at the moment?” And you say, well, I can’t actually tell them what I’m reading at the moment, so I’ve got to find something appropriate that I’m going to say I’m reading at the moment. Alison Jones: They don’t need to know that I’m re-reading the favourite children’s book that I love. Alison Jones: When my children were smaller, it was, you can’t say Room on the Broom. You can’t say that. James Kelley: We saw that play when I was in London about four years ago with my kids. We saw the play, and it was awesome. Alison Jones: I haven’t seen the play. My children are too old for this now, unfortunately. But, yes, I need to go and borrow somebody’s small child to go and read to. Because I really miss it. James Kelley: That might land you in jail. But, okay, besides that. Alison Jones: James, if people want to find out more about you, more about The Crucible’s Gift, where should they go? James Kelley: Yes. First of all you can go thecruciblesgift\ … Jeez. I just … Oh, my gosh. I apologise, Alison. The easiest way is to go to drjameskelley.com, it’s D-R James, D-R- James Kelly, K-E-L-L-E-Y, or they can go to thecruciblesgift.com\extraordinary. And on there, you should be able to get a free chapter of the book. You should be able to get a free companion worksheet about how to value relationships, which comes from the content in the book. And you can get on Amazon and indieboundbooks.org, and all those places. Alison Jones: Awesome. And I will put all those links up on the show notes at extraordinarybusinessbooks.com, as usual. You don’t have to go, if you’re driving, don’t worry about writing them down. That was great. Thank you so much for your time today, James. I really enjoyed that conversation. James Kelley: Thank you, Alison. I appreciate your time, energy, and willingness to have me on your show. adversity, leadership, mindset, publishing, speaking, writing. Bookmark.